This week, Sir Roger Moore came to Paris to promote his new book about the James Bond films : “Bond on Bond” (French Title : “James Bond par Roger Moore”). The high class British actor is still handsome and a witty gentleman. 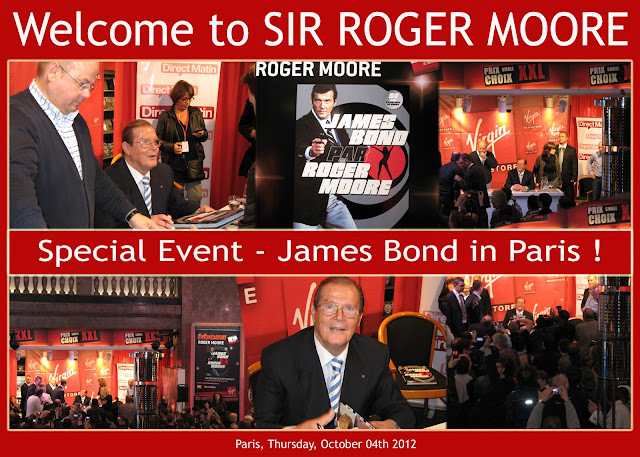 For all the French fans who were there, it was a very trill and wonderful time to share with you, sir. Thank you for your coming to France and kindness. God bless you and come back to France very soon. High Road to China / Les Aventuriers du bout du Monde / Höllenjagd bis ans Ende der Welt / Avventurieri ai confini del mondo / La gran ruta hacia China / Los Aventureros del fin del Mundo / Podniebna droga do Chin (1983).